Huettenmeister, F.G. "The Aramaic Inscription from the Synagogue at H. Ammudim" Israel Exploration Journal 28, 1978: 109-112. Huettenmeister, F.G. "Synagogue und Proseuche bei Josephus und in anderen Quellen" in Begegnungen zwischen Christentum und Judentum in Antike und Mittlealter: Festschrift fur Heinz Schreckenberg. 1993: 163-181. Huttenmeister, F.G. "Die Synagoge: Ihre Entwicklung von einer multifunktionalen Einrichtung zum reinen Kultbau" Gemeinde ohne Tempel; . 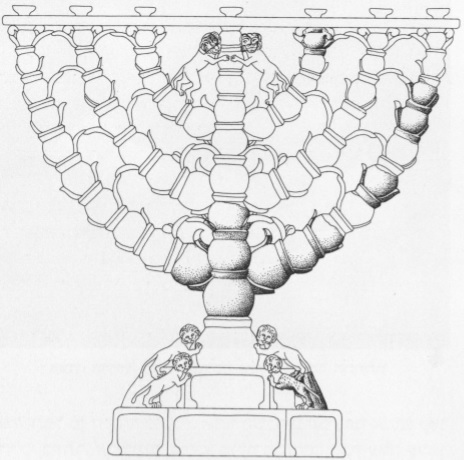 Huttenmeister, F. "The Holy Ark and the Development of Ancient Synagogues" Proceedings of the Eighth World Congress of Jewish Studies 1982: 01-07, (Hebrew). Huttenmeister, F. and Reeg, G. Die Antiken Synagogen in Israel. Vols. I; II. vol.1. Beihefte zum Tu?binger Atlas des Vorderen Orients Nr. 12, Wiesbaden, 1977: 400-404. Huttenmeister, F. and Reeg, G. Die Antiken Synagogen in Israel. Vols. I; II. vol.1. Beihefte zum Tu?binger Atlas des Vorderen Orients Nr. 12, Wiesbaden, 1977: 186-187. Idel, M. "The Zodiac in Jewish Thought" in Written in the Stars. Art and Symbolism of the Zodiac. ed. I. Fishof, Cataloge No. 452, Jerusalem, The Israel Museum, 2001: 21-26. Ilan, Z. "Jewish Menorot from the Golan" Qadmoniot 51-52, 1980: 117-119, (Hebrew). Ilan, Z. "A Survey of Ancient Synagogues in Galilee" Eretz Israel 19, 1987: 169-198, (Hebrew). 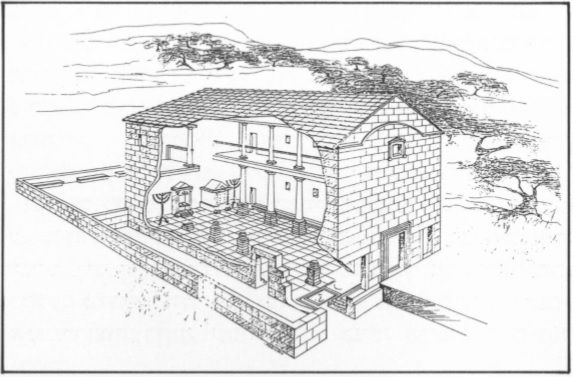 Ilan, Z. and Damati, E. Meroth; The Ancient Jewish Village. ed. Z. Ilan and E. Damati, Tel Aviv, 1987, (Hebrew; English summary). Ilan, Z. Synagogues in the Galilee and the Golan. ed. Ariel 52, Jerusalem, 1987, (Hebrew). Ilan, Z. and Izdarechet, A. Arbel- An Ancient Jewish Settlement in the Eastern Lower Galilee. Tel Aviv, 1988: 76-148, (Hebrew). Ilan, Z. "The Synagogue and Beth Midrash of Meroth" in Ancient Synagogues in Israel; Third-Seventh Century C.E. ed. R. Hachlili, Bar International Series 499, Oxford, 1989: 21-41. Ilan, Z. and Izdarechet, A. "Arbel- An Ancient Town in the Eastern Lower Galilee" Qadmoniot 22, 1989: 111-117, (Hebrew). Ilan, Z. and Amit, D. "Maon" The New Encyclopedia of Archeological Excavations in the Holy Land. 1993: 942-944. Ilan, Z. "Meroth" The New Encyclopedia of Archeological Excavations in the Holy Land. 1993: 1028-1031. Ilan, Z. 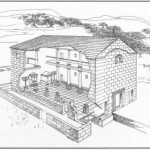 "The Synagogue and Beth Midrash at Meroth" in Ancient Synagogues; Historical Analysis and Archaeological Discovery. ed. D. Urman and P.V.M. Flesher, Vol. 1, Leiden, 1995: 256-287. Ilan, Z. and Izdarechet, A. "Arbel" The New Encyclopedia of Archeological Excavations in the Holy Land. Jerusalem, 1993: 87-89. Ilan, Z. "Ancient Synagogues in Israel" . Tel Aviv, 1991: 494-496, (Hebrew). Ilan, Z. "Ancient Synagogues in Israel" . Tel Aviv, 1991: 220-221, (Hebrew). Ilan, Z. "Ancient Synagogues in Israel" . Tel Aviv, 1991: 131, (Hebrew). Ilan, Z. Ancient Synagogues in Israel Tel Aviv, 1991: 307, (Hebrew). Ilan, Z. Ancient Synagogues in Israel. Tel Aviv, 1991: 28, (Hebrew). Ilan, Z. Ancient Synagogues in Israel. Tel Aviv, 1991: 33, (Hebrew). Ilan, Z. Ancient Synagogues in Israel. Tel Aviv, 1991: 31-32, (Hebrew). Ilan, Z. Ancient Synagogues in Israel. Tel Aviv, 1991: 50, (Hebrew). Ilan, Z. Ancient Synagogues in Israel. Tel Aviv, 1991: 34, (Hebrew). Ilan, Z. Ancient Synagogues in Israel. Tel Aviv, 1991: 52, (Hebrew). Ilan, Z. Ancient Synagogues in Israel. Tel Aviv, 1991: 54-55, (Hebrew). Ilan, Z. Ancient Synagogues in Israel. Tel Aviv, 1991: 126, (Hebrew). Ilan, Z. Ancient Synagogues in Israel. Tel Aviv, 1991: 56, (Hebrew). Ilan, Z. Ancient Synagogues in Israel. Tel Aviv, 1991: 256, (Hebrew). Ilan, Z. Ancient Synagogues in Israel. Tel Aviv, 1991: 257, (Hebrew). Ilan, Z. Ancient Synagogues in Israel. Tel Aviv, 1991: 224-225, (Hebrew). Ilan, Z. Ancient Synagogues in Israel. Tel Aviv, 1991: 264, (Hebrew). Ilan, Z. Ancient Synagogues in Israel. Tel Aviv, 1991: 267-268, (Hebrew). Ilan, Z. Ancient Synagogues in Israel. Tel Aviv, 1991: 260-261, (Hebrew). Ilan, Z. Ancient Synagogues in Israel. Tel Aviv, 1991: 195, (Hebrew). Ilan, Z. Ancient Synagogues in Israel. Tel Aviv, 1991: 167-168, (Hebrew). Ilan, Z. Ancient Synagogues in Israel. Tel Aviv, 1991: 21, (Hebrew). Ilan, Z. Ancient Synagogues in Israel. Tel Aviv, 1991: 136, (Hebrew).